Looking for the Best Coffee Table Books? We make it easy for you to pick your favorites. Let me start by congratulating you. Not everyone recognizes the importance of showcasing a beautiful coffee table book. These books are not just a BIG BOOK OF BEAUTIFUL IMAGES. The best coffee table books are not books that are Best Sellers or that everyone is rushing to buy today. The ones you want to be looking for are those that showcase your individual interests. The most common displayed books are those on Interior Designs, Fashion, Art and Photography. But you can just as easily find books on knitting, gardening, equestrian, wine and so much more! Here you will find a nice mix of Best Sellers of 2019; as well as some lesser known ones that might catch your interest. Wendy Goodman definitely delivers the goods in this beautifully illustrated book. "May I Come In?" encompasses her 30 years of design hunting. The cover is stunning and the pages within inspire you to take some design risks of your own. It is an irresistible visual record of the art of living by one of its most penetrating observers. "I bought this book because i am a fan of Wendy Goodman and I am giving to all my friends because this book goes above and beyond all expectations. It is a wonderfully eclectic collection of amazing abodes with stunning pictures AND the wittiness of the stories makes it a page turner. What a welcome addition to the library." If you have not been living under a rock, you know Brandon Stanton and his amazing blog that boasts over 4 million loyal fans. His book "Humans of New York" (named the same as his blog) is your hands-on look at the photos on his blog. While this was first published in 2013, your coffee table book collection would not be complete without it ! "This is one of the best books I have read lately or maybe one of the all-time fav books for that matter. Each picture has a story! I feel like I read the collections of elaborate stories, each one of which has so much depth and profoundness. Come to think of it, it got to be because each picture just cut out one moment of those people’s life, real people’s life... "
Watch HGTV? Then you know who Joanna Gaines is and the miracles she works on her clients' homes. Her latest book, "Homebody - A Guide to Creating Spaces You Never Want To Leave" uses examples from her own farmhouse to explain how to create your own happy place. Of course, if you are die-hard Fixer Upper fan, you probably already have her other books, especially the best-selling "Magnolia Table - A Collection of Recipes for Gathering". "I just received my copy and obviously have not read it cover to cover, but I can already tell this is a great book. First off, the quality is incredible. It makes a beautiful coffee table book and will look just as nice sitting on your bookcase. The pages are matte and not glossy, (no glare) which makes it easier to really study the images and capture the true sense of the shot. Joanna encourages you to study the pictures to help you uncover your personal style and what you gravitate towards. This book really makes a wonderful gift..."
I am an advocate for the importance of greenery in our homes. Not only do they help keep your home's environment healthy, they look so gorgeous while doing it! If the thought of find and nurturing plants in your home makes you run screaming, give this book a look-see. 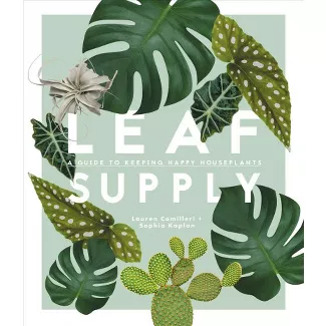 "Leaf Supply" gives you insight on adding greenery that is practical and aesthetically pleasing. It even answers pet-related questions. "Stop what you’re doing and buy this book. It looks pretty, is witty, and is very informative." A woman who transcends time and trends, Iris Apfel is a true original, one of the most dynamic personalities in the worlds of fashion, textiles, and interior design. Can you see your coffee table come to life with this awesome cover sitting atop it? Her book "Iris Apfel: Accidental Icon" will surely become an icon in your home too. With these amazing stories and anecdotes to ensure you always have something unique to talk about. "Love it! The format is fun and easy to read. I am an artist, and a fan of Ms. Apfel. She can do no wrong! … Easy read, and fun format. Great gift for my older girlfriends. She is an inspiration all around! You go, Iris. I hope you live to 110, at least!!!"